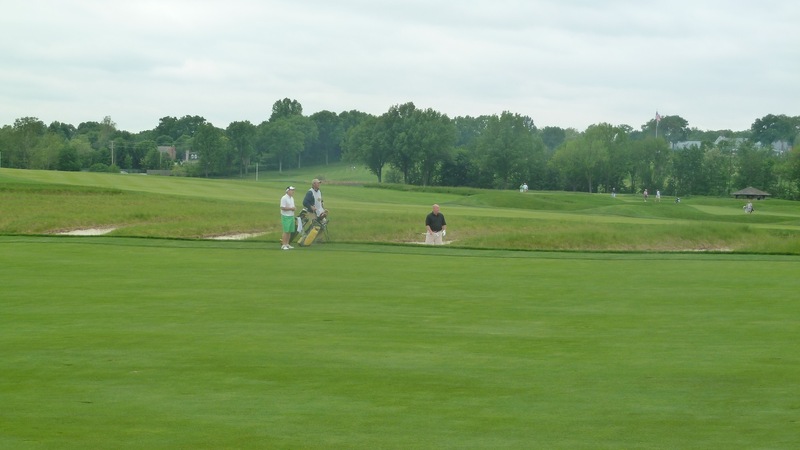 Once we were sufficiently intimidated by the practice green we headed to the 1st tee to start our game. 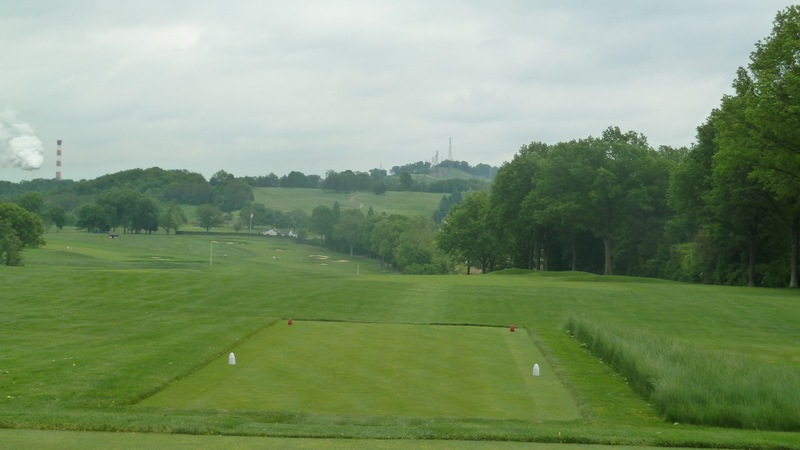 The tee options were green at 7,255 yards, blue at 6,436 yards, white at 6,223 yards and red at 5,692 yards. The red tees play to a par of 75 and the rest to a par of 71. We elected for the blue tees which was perfectly acceptable to me. 7,255 yards is way more than I will ever intentionally tackle. 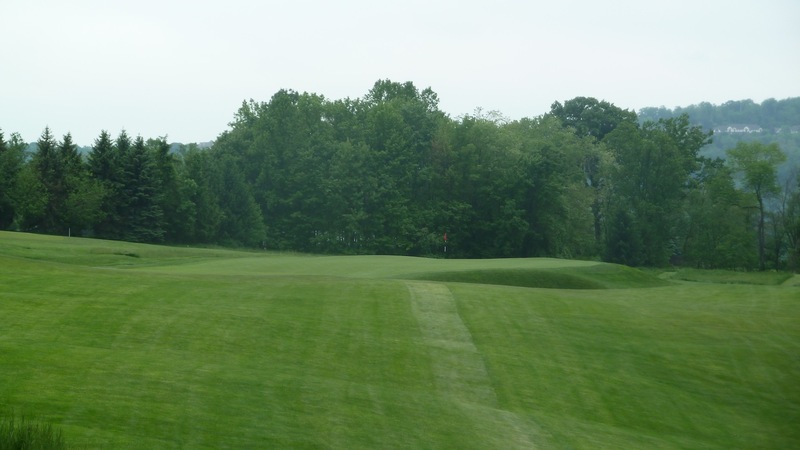 The 1st hole is a 441 yard par 4 that plays significantly down hill. 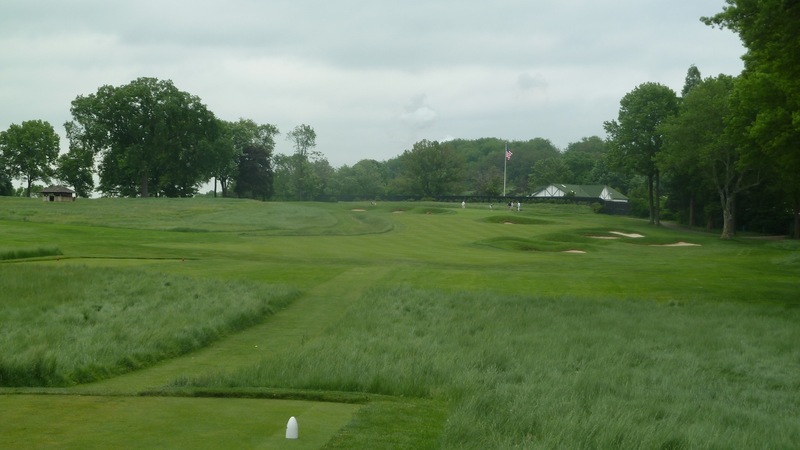 There are bunkers off to the left of the fairway and trouble too far to the right, so players who want to start their Oakmont experience off well need to hit it down the middle. The photo below was taken from the tee box. Pictured below is the approach shot into the 1st green. 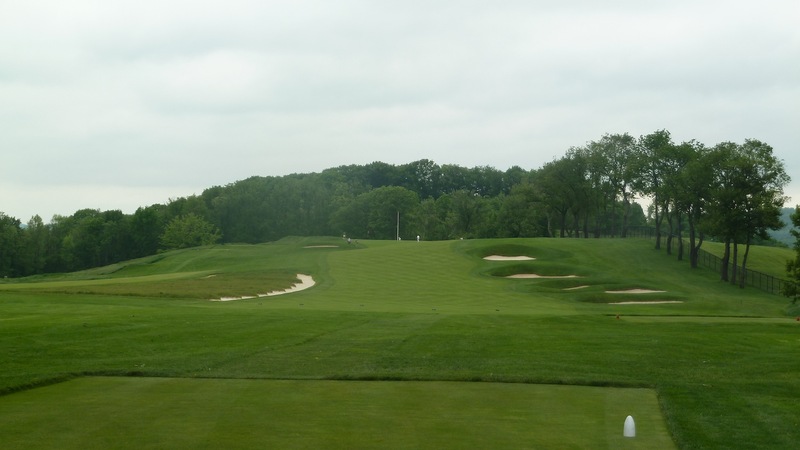 Under the firm and fast conditions that Oakmont plays it’s a very good idea to land approach shots short and let them bound onto the green. The wall in the background is the wall that separates the golf course from I-76. 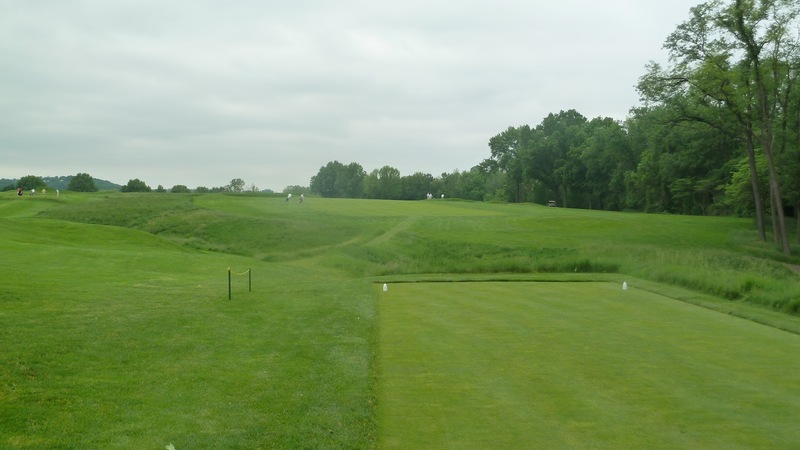 The interstate runs through the golf course with holes 1 and 9 through 18 on one side and holes 2 through 8 on the other. Below is a closer look at the first green. I actually came up a little short on this and made a nice little pitch onto the green and my ball ran out all the way to the back of the green leaving me a 50 footer for par. After watching my pitch roll I was scared to hit my putt too hard and ended up 3 putting. As they say . 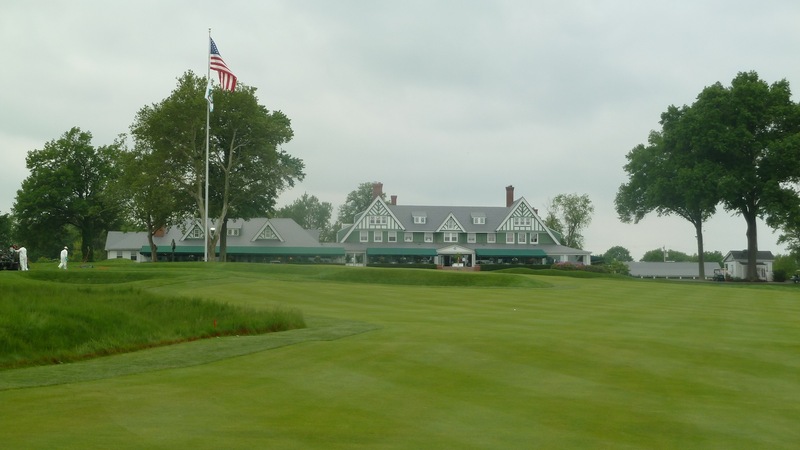 . . welcome to Oakmont. After this hole we walked across the footbridge to the other side of I-76 for holes 2 through 8. The 2nd hole is a nice little par 4 that we played from 325 yards. A player can choose to either hit a safe layup shot of about 200 yards or blast a driver up and risk finding the bunkers. A nice little risk/reward hole. 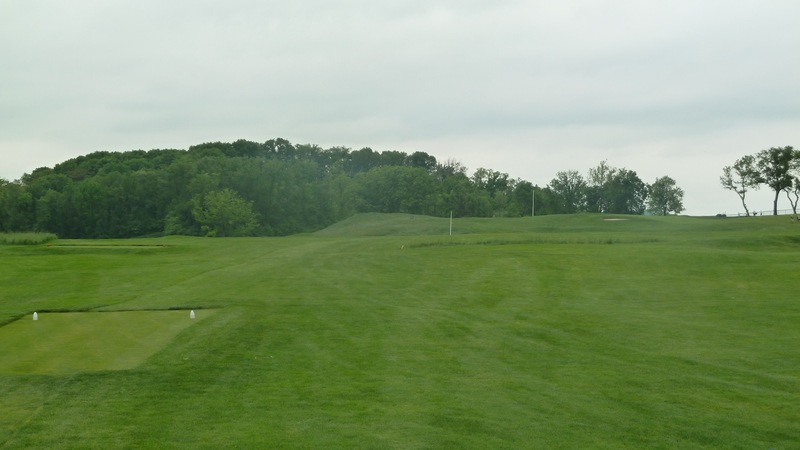 The photo below was taken from the tee. Below is a photo of the approach shot from the layup position. there are bunkers to the left of the green as well as behind it. I checked them both out. The front ones first and then the back. Not a strong start for me. Here is closer view of the green which runs back to front. My shot coming out of the back bunker didn’t have a chance to even stay on the green and rolled right off the front. 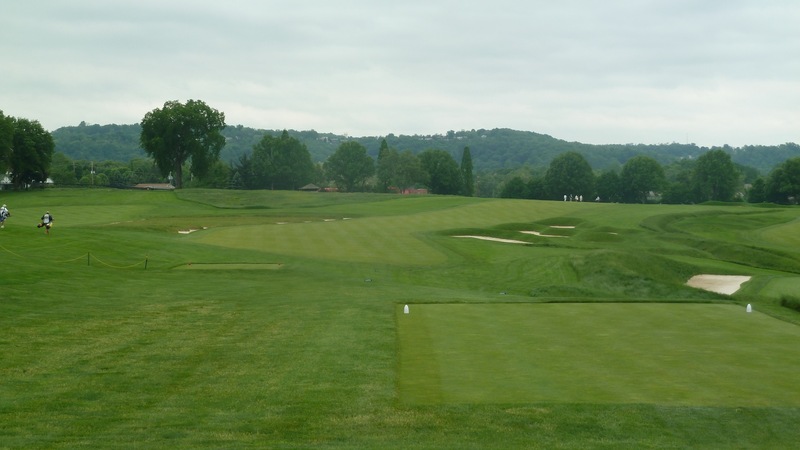 The 3rd hole is one of the famous ones at Oakmont. This is the hole with the “church pew” bunkers. The hole is a par 4 that we played from 390 yards. The photo below was taken from the tee box. 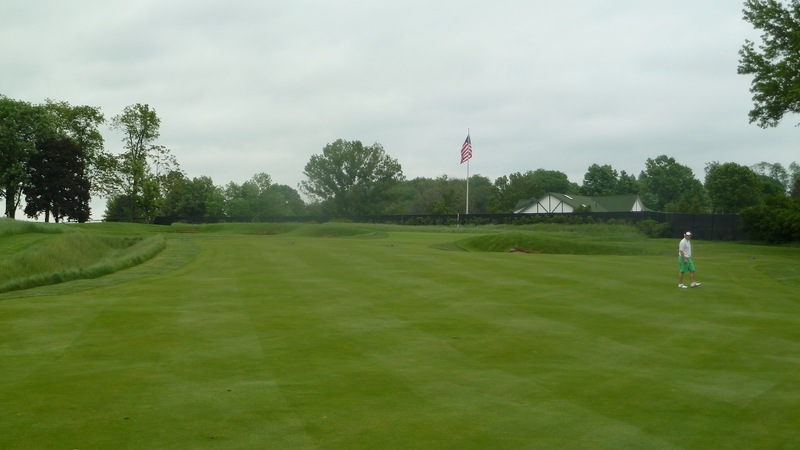 The church pews run along the left side of the fairway. Don’t be fooled into thinking that a miss to the right is safe. 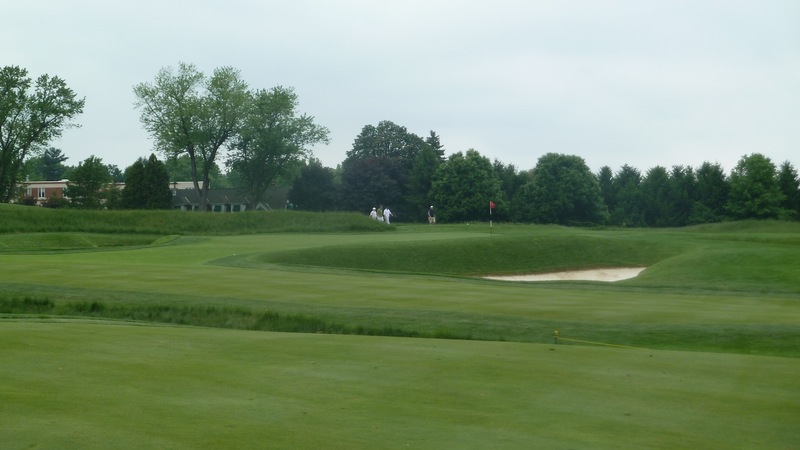 Many of the bunkers of the right side of the fairway are deep and leave little to no chance for an average amateur to hit their second shot onto the green. As usual, I am stating this from experience. Here is a closer view of the church pew bunkers. And here is one of the members of our group who had the misfortune of finding his way into the church pews. When he hit his drive and it started veering towards the pews the caddies yelled “get an aisle seat, get an aisle seat!! !” Apparently if you have to be in the pews the place to be is on the edge where the actual pews are not impeding your shot. The pews themselves are pretty hairy and not a great a great spot to be either. The caddies said that an aisle seat was by far the best option. 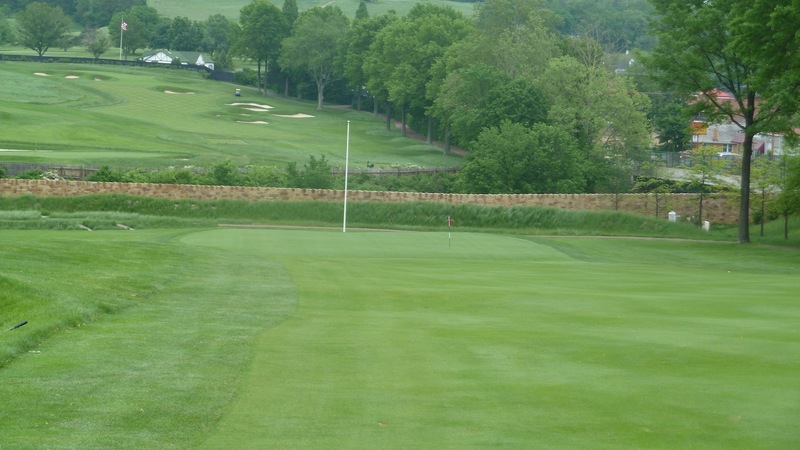 Below is a photo of the approach shot into the 3rd green from the middle of the fairway. It’s a pretty severe uphill shot that requires some extra club. 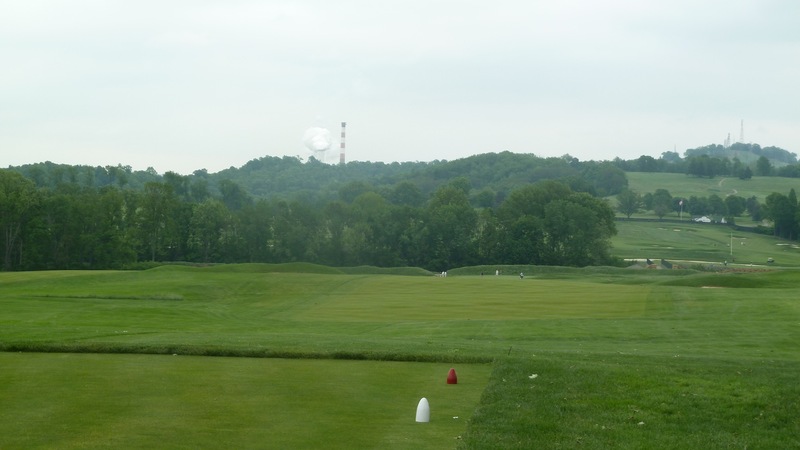 Below is a photo taken from the 4th tee. This hole is a par 5 that we played from 512 yards. Just in case anyone is disappointed that they didn’t hit into the church pews on the 3rd hole, fear not, there is a second chance. The 4th hole runs along side the 3rd and the same set of church pew bunkers are in play down the left side of the 4th hole as well. 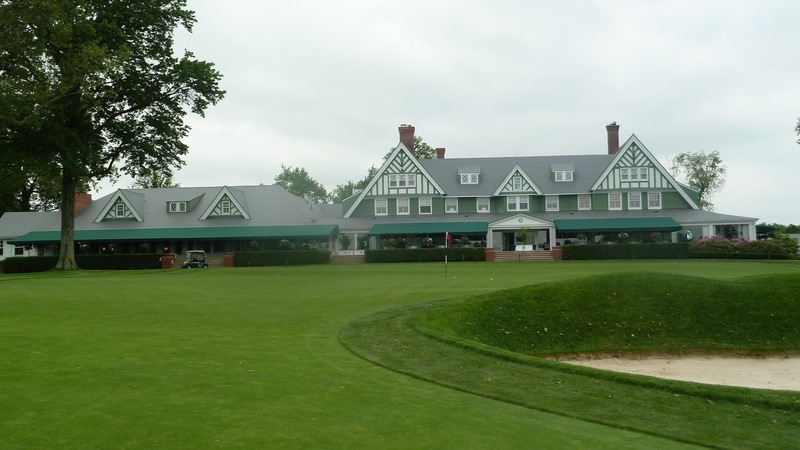 ‘Tis not good to have a hook at Oakmont Country Club. Also note the deep bunkers on the right side waiting for the slicers. 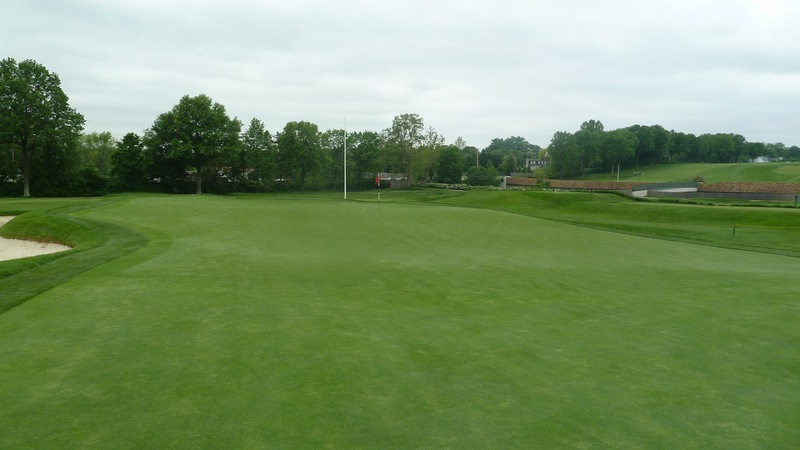 The photo below is of the 4th green which is quite a good sized green. 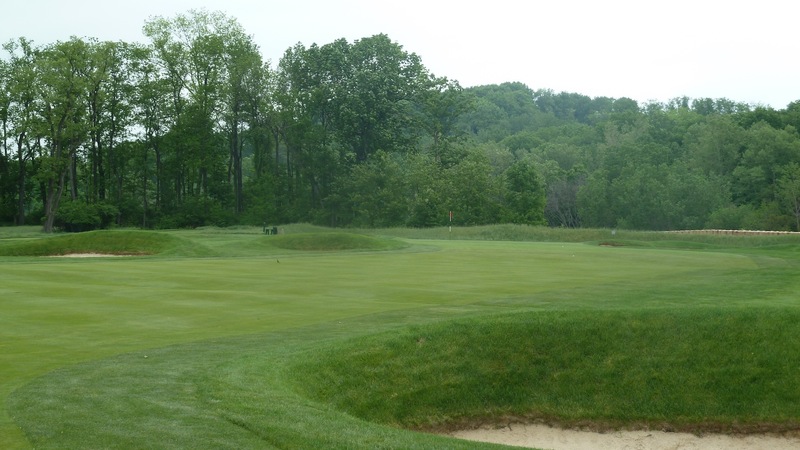 There are bunkers on the left of the green so if a player is going for this green in two and isn’t sure their second shot will make it all the way to the green, its best to aim at the right side of the green. 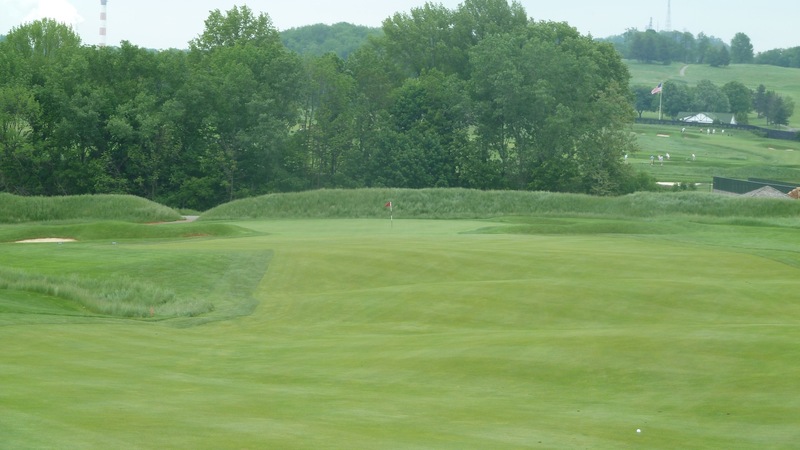 Below is another view of the 4th green. I loved the 5th hole which is another short par 4. 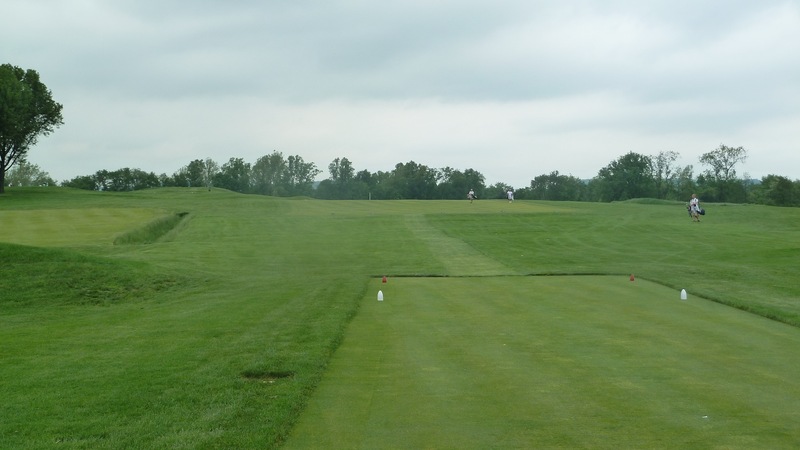 This one we played from 349 yards and the photo below was taken from the tee box. The green is not visible from the tee so the best plan is to hit a 220-240 yard shot out towards the lower of the two while poles. Below is the approach shot to the 5th green. There is plenty of rough and lots of bunkers out there for balls that don’t find the putting surface. 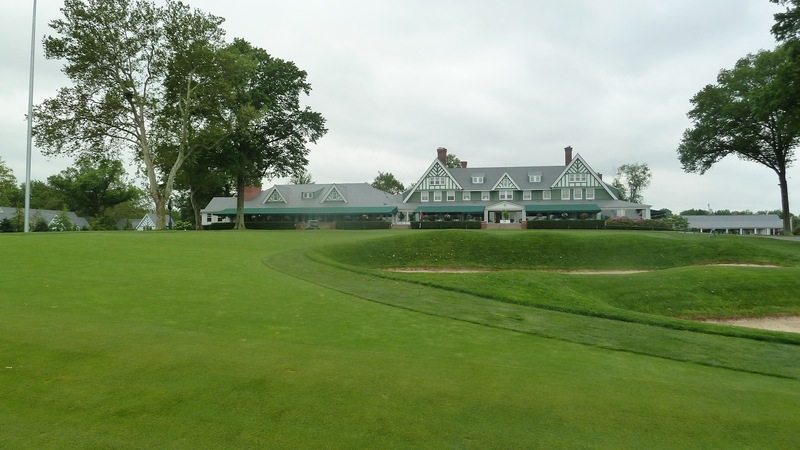 As I’ve have discovered on the first four holes at Oakmont, there are no easy up and downs here. Here is a closer view of the green. The 6th hole is the first par 3 on the course and we played it from 168 yards. 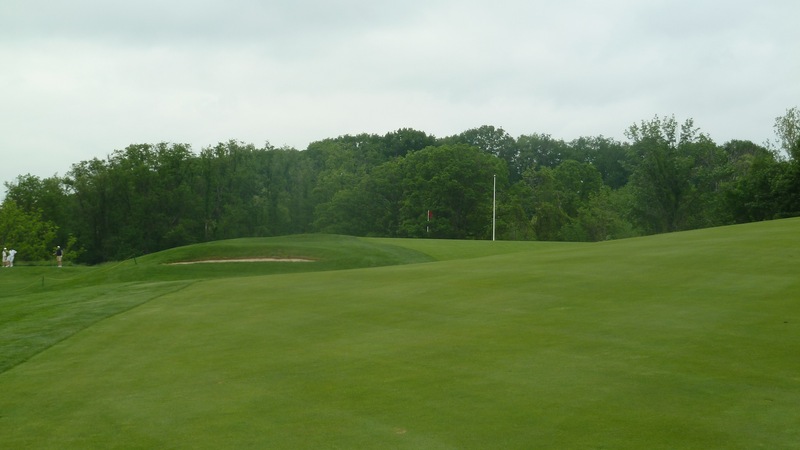 The green sits on a hill slanting from right to left, so missing right makes another tough up and down. The 7th hole is a par 4 that we played from 370 yards. 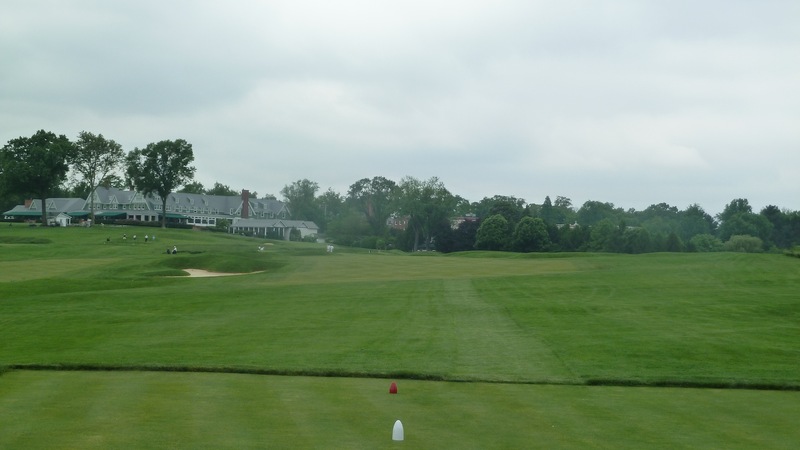 The photo below was taken from the tee box and the green is not visible from this vantage point. 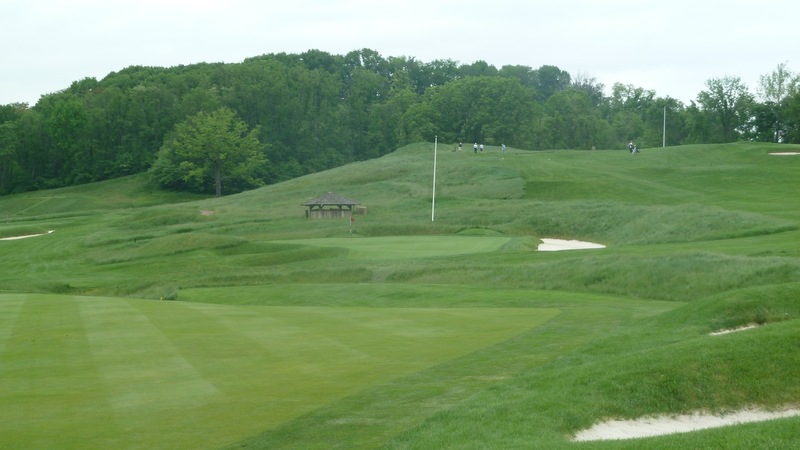 Below is a photo of the approach into the 7th green. The bunker on the right is every bit as deep as it looks. And here is another view of the 7th green. The 8th hole is a man sized par 3 of 225 yards from the blue tees. From the green tees it is a whopping 288 yards. If I were playing those tees I would probably lay up to the right and take my chances on the up and down. The bunker on the left known as “Sahara” is absolutely huge and anything that goes that way is probably going to end up in it. 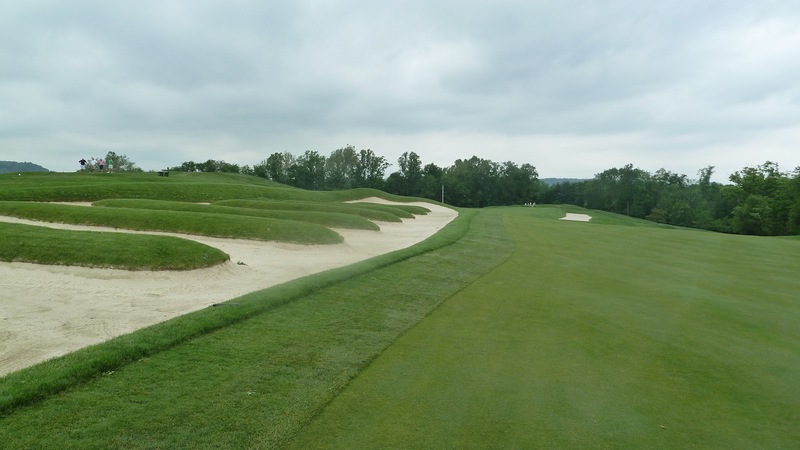 It is the largest bunker on the entire course and does not make for an easy up and down. After the 8th hole we crossed back over I-76 to play 9 through 18. 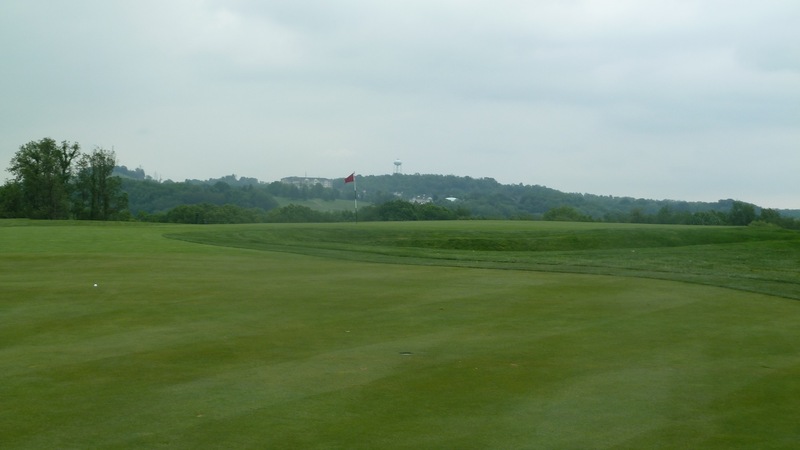 The photo below was taken from the 9th tee box which is a 462 yard par 5. 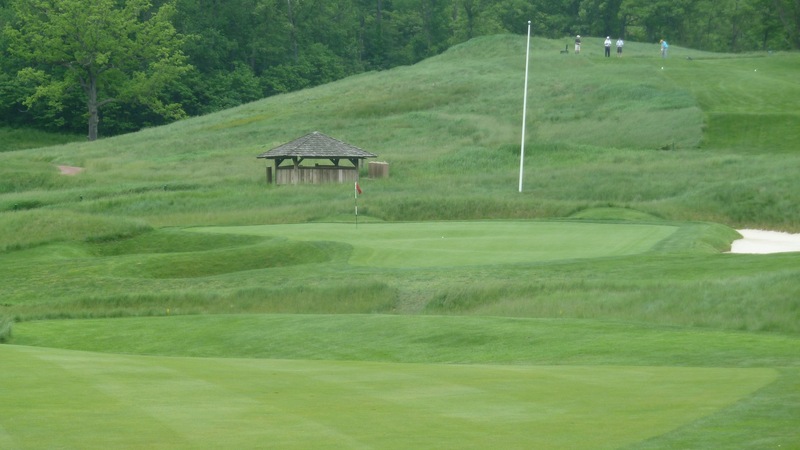 The hole plays dramatically uphill, which makes it a little longer, but it is still reachable in two for many players. Below is the approach shot into the green. 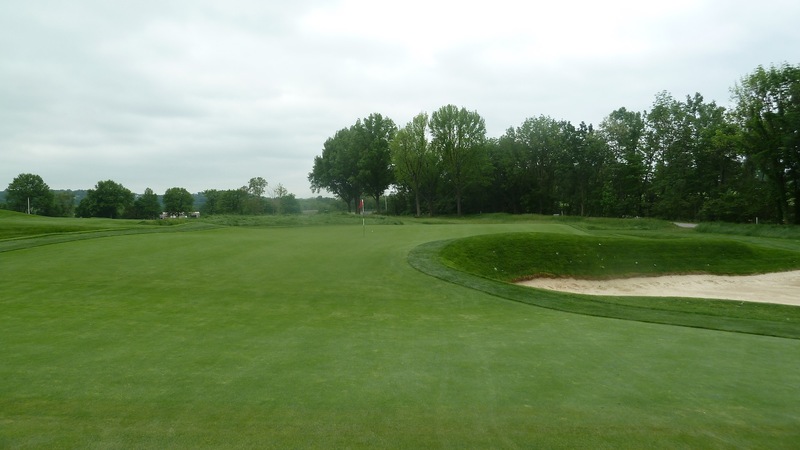 Here is a view that shows some of the deep bunkers fronting the green. And here is a little closer look at the green. After a quick stop at the halfway hut we went directly to the 10th hole which we played as a 440 yard par 4. It’s long, but it does play downhill, so that shortens it considerably. The photo below was taken from the tee box. 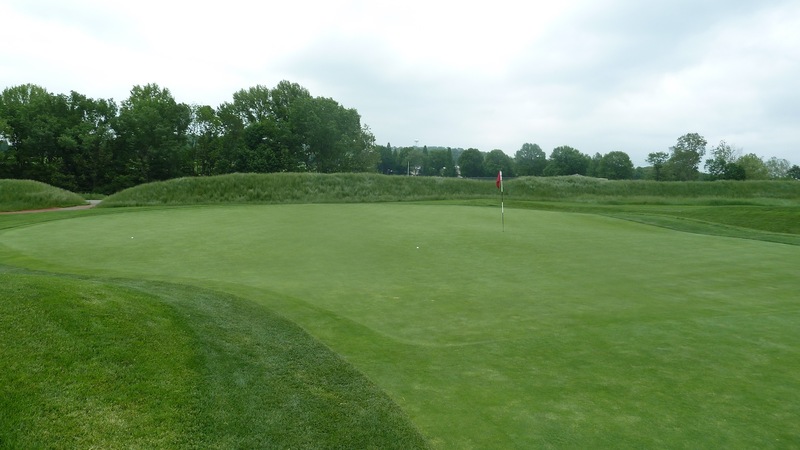 Below is a photo of the approach shot into the 10th green. 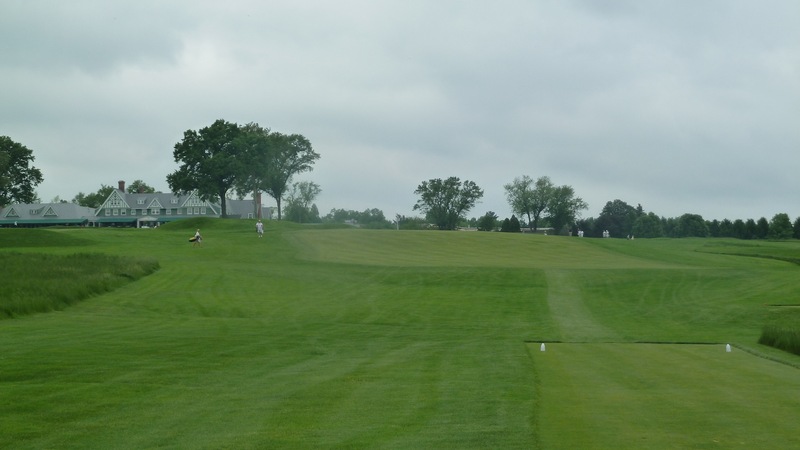 There are no hazards in front of the green so a shot can be hit short and run onto the green. This is probably a requirement when the course is playing at its fastest. The photo below is a closer look at the 10th green. The 11th hole is a nice little short par 4 that we played from 328 yards. 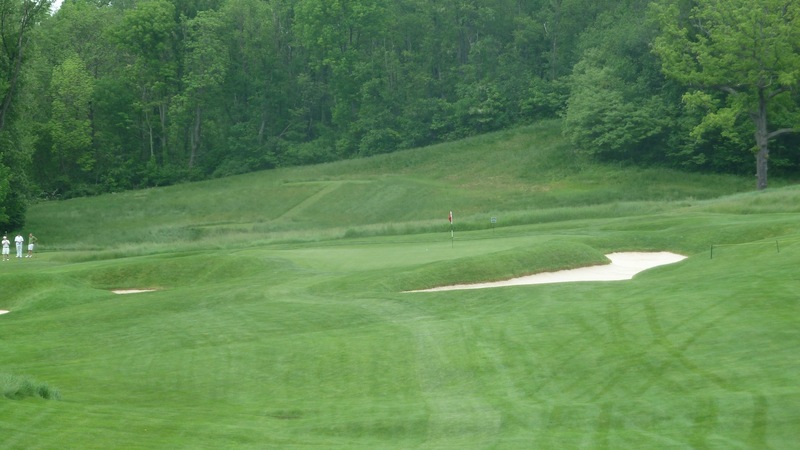 It is straight uphill so it plays a little longer than the number, but it is still a short par 4. The photo below was taken from the tee box. The cluster of people to the right side of the fairway is the group in front of us on the putting green. 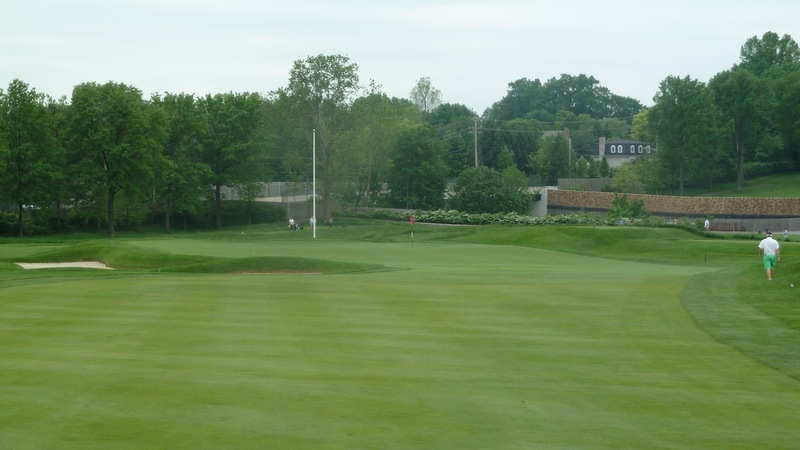 Below is a photo of the 11th green. The 12th hole, pictured from the tee box below, is a longish par 5 that we played from 562 yards. This one plays downhill which cuts some of that yardage off. 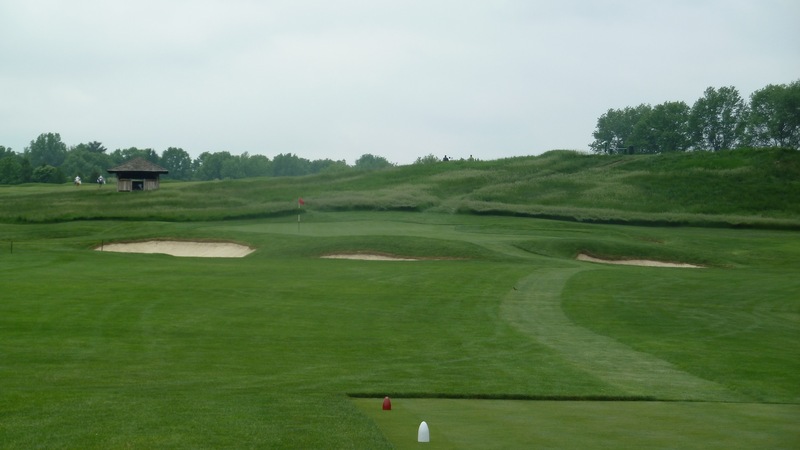 There are bunkers along the left and right sides of the fairway that need to be avoided on the drive. Below is a look at the 12th green from about 100 yards out. 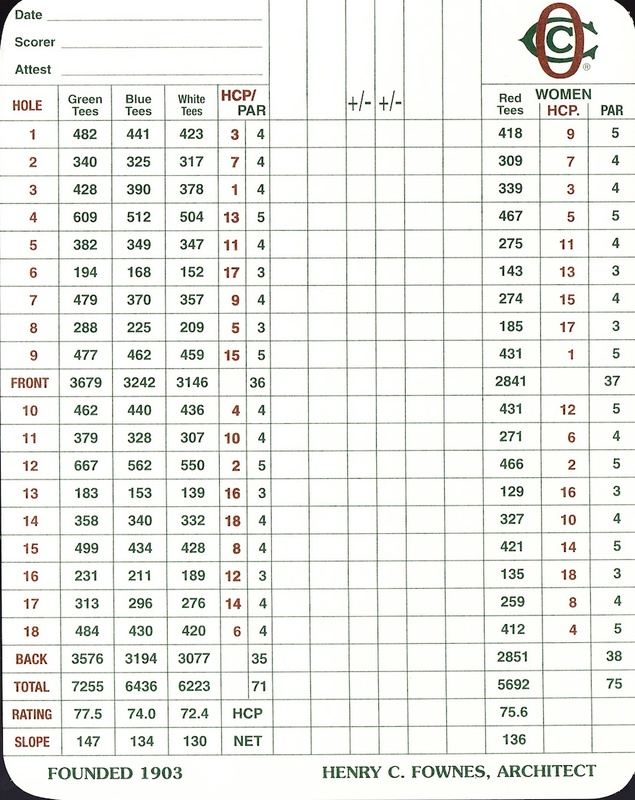 The 153 yard par 3 13th hole proved to be a bit trickier than it looks on the card. 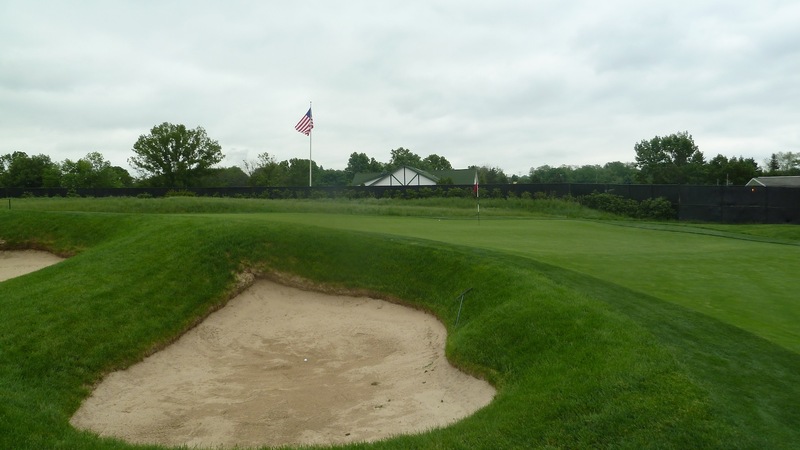 There are deep bunkers all around the green to catch shots that miss the putting surface. The 14th hole is another shortish par 4 that we played from 340 yards. Below is a photo that was taken from the tee box. 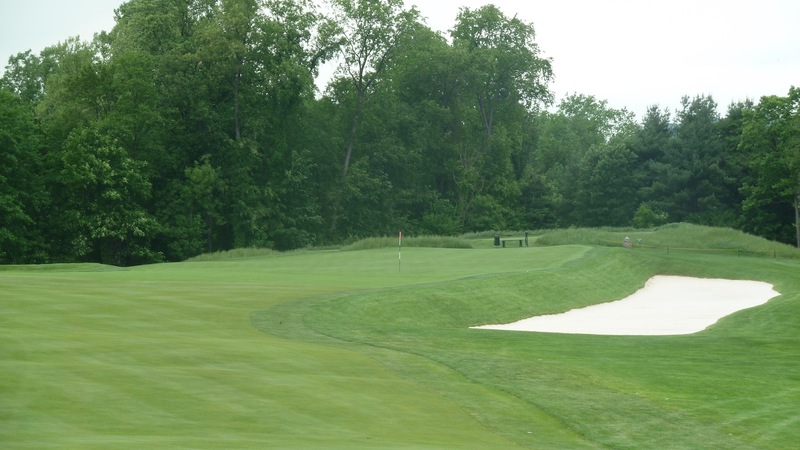 The 15th hole, pictured below from the tee box, is a spectacular par 4 that we played from 434 yards. The tee shot is blind and the caddies informed us that the best play was to hit the ball up the left side of the fairway as the hole falls off to the right. 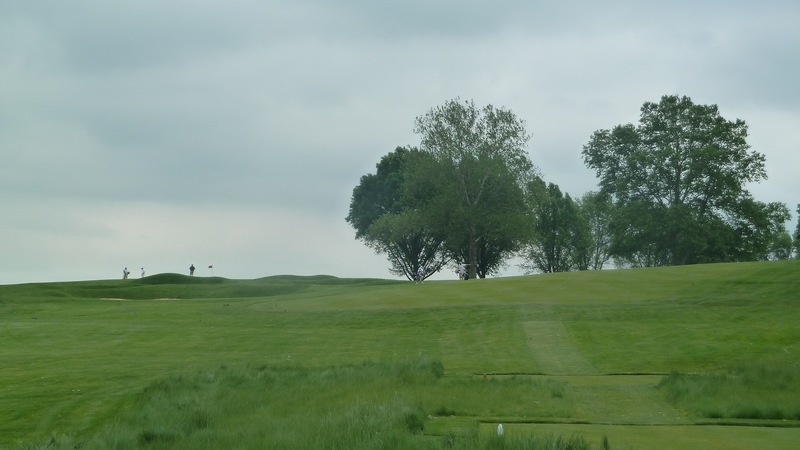 What is not visible from the tees is that there is another complex of church pew bunkers on the left side of the fairway that will give a player trouble if the drive is hit too far to the left. These church pews are not quite as nasty as the ones on the 3rd and 4th holes because the grassy areas have been mowed much more than the other ones. 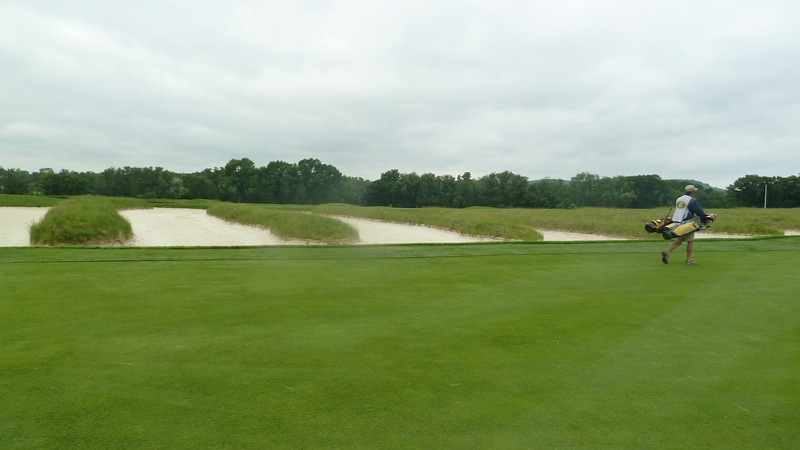 The photo below shows these bunkers. 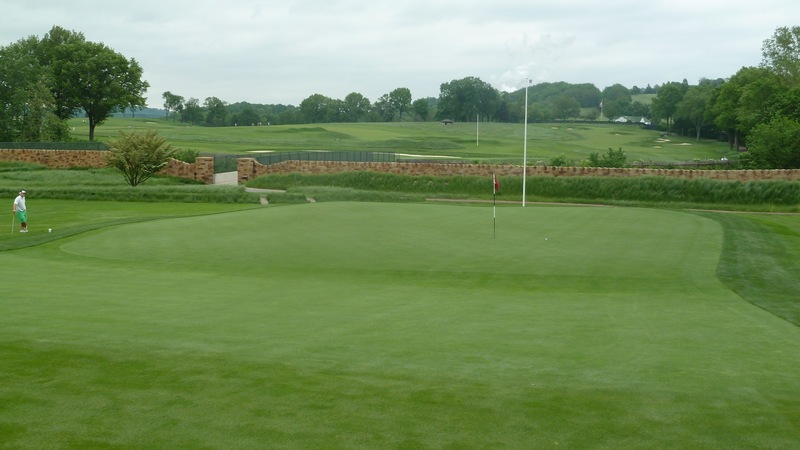 And below is a photo of the 15th green. The 16th hole is the final par 3 on the course and we played it from a healthy 211 yards. This green is pretty good sized so there is good opportunity to hit it. Missing it will likely result in an up and down attempt from a bunker. The 17th hole is a great short par 4 that we played from 296 yards. 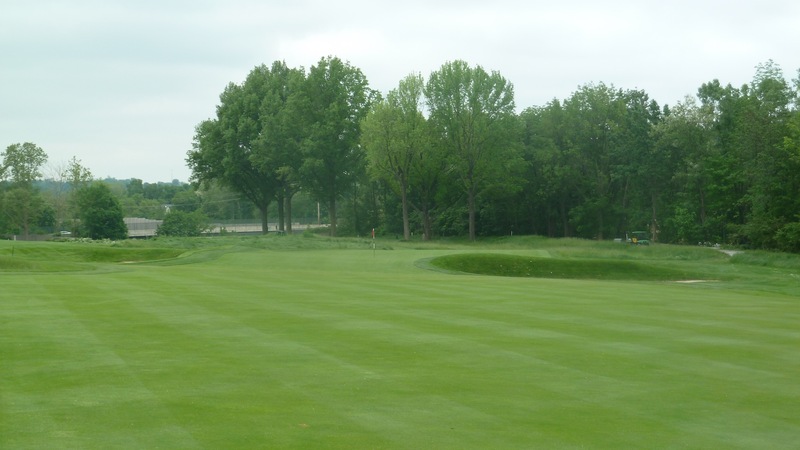 This hole may be remembered as the drivable par 4 from the 2007 US Open. 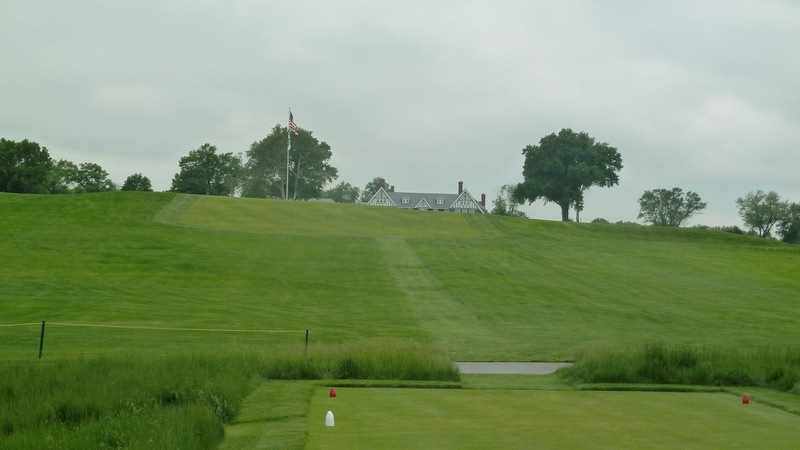 The photo below was taken from the tee box and the two lines of play are to hit driver directly at the flag in attempt to drive the green or to hit a shorter club out towards the trees to the right and then pitch onto the green. And here is a closer look at the green and “Big Mouth”. I wish I had a photo of me hitting my ball out of there to give it more perspective on how deep this bunker is. It was a tough shot to get it out of there and keep it on the green. 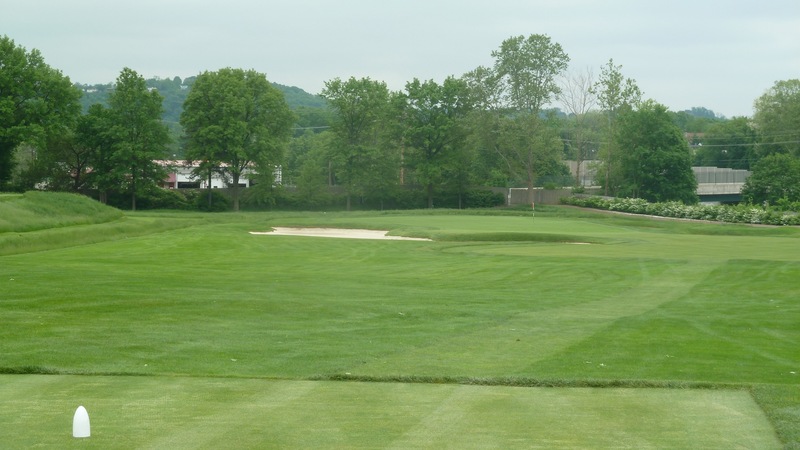 Below is a photo of the 18th hole which is a lengthy par 4 that we played from 430 yards. There are bunkers all over this hole just waiting to catch those poor shots that Mr. Fownes didn’t want to go unpunished. The approach into the 18th green is pictured below and is a fairly straight forward shot as long at the greenside bunker is avoided. 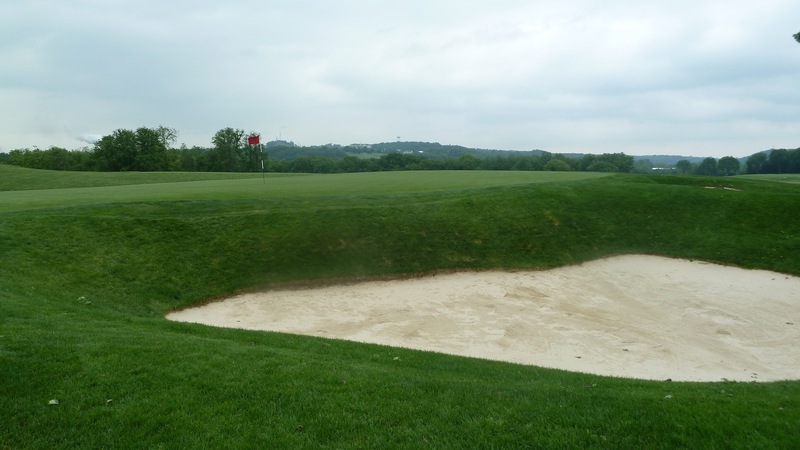 As most of Oakmont’s bunker are, this one is deep and will require a good shot to escape it. 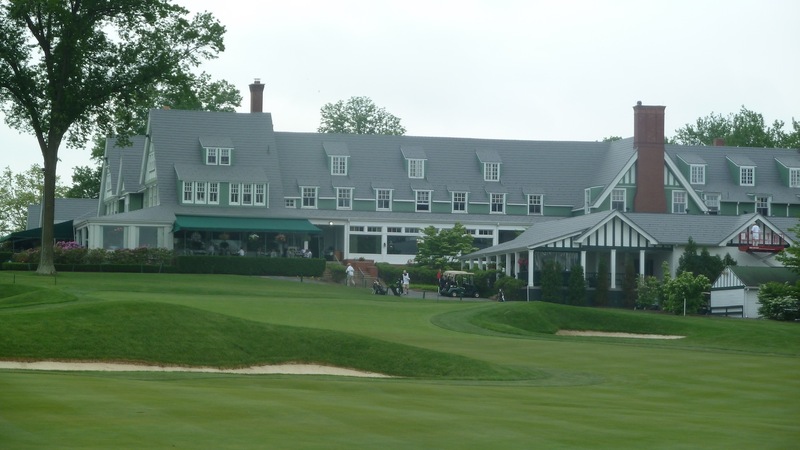 In conclusion I’m not sure what can I say about Oakmont Country Club other than it lives up to its reputation . . . and then some. 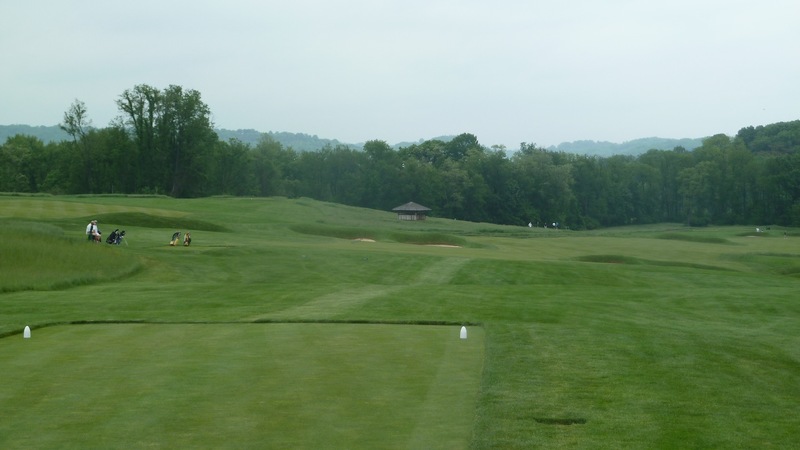 I absolutely loved the course and it became an instant personal favorite. 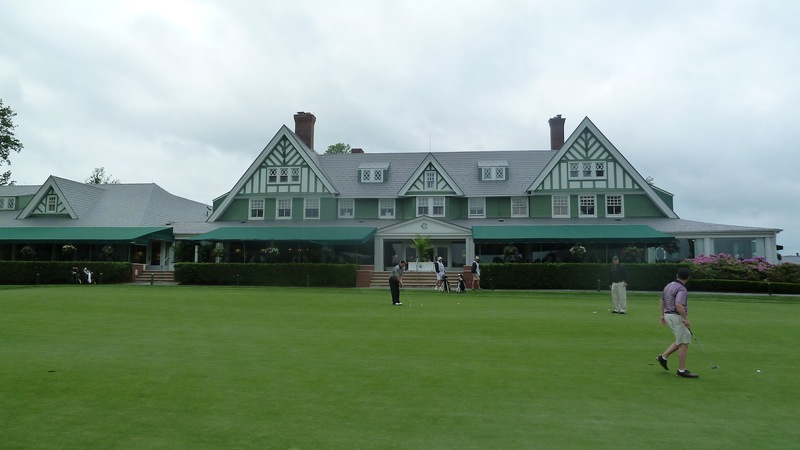 In a part of the country that is loaded with tree lined championship golf courses Oakmont stands out as unique. It simply doesn’t feel anything like the others which, in my opinion, gives it a distinct personality all its own. 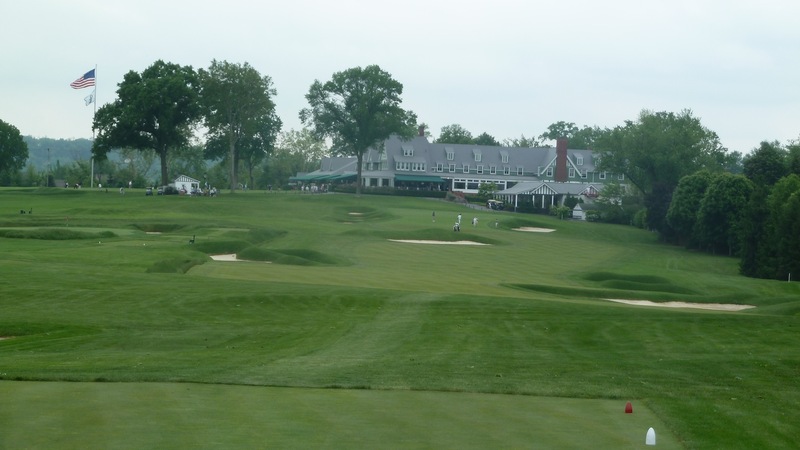 I loved every hole and am in complete agreement with the accolades its receives from the rankings as well as the praise showered on it every decade or so when we are lucky enough to see it on television for a major championship. I can’t wait for 2017 so I can see it again!